Volunteers helping construct Cobi Carmichael’s wheelchair ramp included, clockwise from back left, CapitalPlus CFO Rich James; Farragut High School senior Drew Applegate, son of CapitalPlus president Scott Applegate (not pictured); Zerlina Waldrop; James’ son and FHS freshman Ethan James; and Waldrop’s son and FHS senior Preston Waldrop. Farragut resident and Amramp of East Tennessee owner Dave Taylor was not looking for work, but looking to help when he approached East Tennessee Children’s Hospital with an idea two years ago. Based in Farragut, Amramp is a for-profit company that creates accessibility products and adaptations, both inside and outside homes and businesses, but Taylor wanted to do more. Taylor had consistently reached out in search of that opportunity when the hospital suggested Sean and Stephanie Carmichael’s family’s needs might be the appropriate project. The Carmichaels have adopted four children with Down Syndrome, the youngest of whom, Cobi, also has been battling cancer. “Between his surgeries and treatments, he is no longer able to walk,” Taylor said. “I met with them and realized their situation was exactly what we had been looking for. It was an amazing experience to meet this family,” he added. Taylor said he quickly realized, however, he would need some help. “It was a fairly large and complex ramp system they needed and would be a fairly expensive one, too,” he said. Taylor said due to the home’s driveway-to-house access, which included a long sidewalk and several steps in between, a series of ramps in four separate sections totaling 74 feet was necessary. He approached his long-time friend and business associate, Farragut resident Scott Applegate, owner of CapitalPlus Construction Services, and the two agreed to partner on the undertaking. “We had talked about doing a project (together) for someone needing it, and this could not have been any more perfect of a situation,” Applegate said. The installation took place Saturday, Aug. 11, and involved 10 volunteers — eight from CapitalPlus, along with Taylor and his son, Farragut High School graduate Xander Taylor. Applegate’s son, FHS senior Andrew Applegate, also volunteered, as did Zerlina Waldrop, her son, FHS senior Preston Waldrop, and FHS freshman Ethan James. 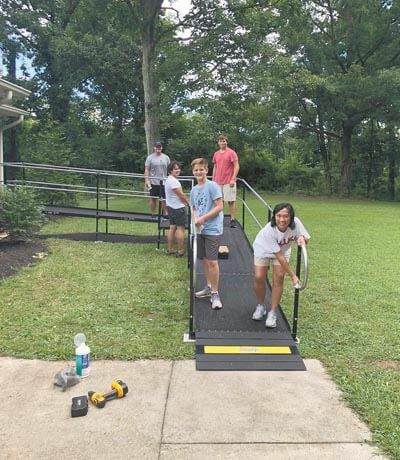 While the ramp installation will count as a service project for the high school students, Applegate said he knows it “really made an impact on my son — he said it did. “You don’t realize the satisfaction in helping people unless you can meet them and see what a difference you can make,” he added, noting he had made anonymous donations to help others in need. “But to actually meet that little boy, and for him to hug your neck, and see how much what you are doing helps him and his family, it is just incredible. Being able to complete the project when they did was very good timing for the Carmichaels, as they had yet to receive Cobi’s wheelchair. “What was really nice was that we were able to do it all on that Saturday, before Cobi’s wheelchair was going to be delivered the following (week),” Taylor said. Stephanie Carmichael said she was thankful for the help provided by the Farragut crew. The Carmichaels are not seeking additional financial assistance, but were grateful about the generosity of Taylor and Applegate. “Between raising the boys, work and Cobi’s chemo, we are able to pay our bills, but it is a bare bones budget … so this helped us more than I can say.”” Carmichael said. Applegate said it is his hope that this type of assistance is something they can provide again.